With the hurricane season starting on June 1, we all can be reminded of what we should do in an emergency or disaster and how to take care of our pet. 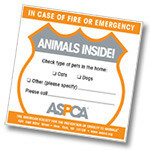 The ASPCA is a great resource with information on Emergency Pet Preparedness, and you can even get a free Pet Rescue Sticker sent to you, so people will know that you have a pet in your house in case of an emergency. The director of Disaster Responsive Services for ASPCA says “planning ahead can make all the difference! Be prepared to leave with your pet. Make sure you have a leash, muzzle, and carrier for each one of your pets handy and ready to use. Having the resources to transport your pet safely with you when you have to evacuate is very important”. This entry was posted on Wednesday, May 23rd, 2007 at 9:00 am	and is filed under Other Pets, Pet Food Recalls & Safety, Cats, Dogs, National Dog, Cat & Pet Info, Veterinary/Medical. You can follow any responses to this entry through the RSS 2.0 feed. Both comments and pings are currently closed. It is also worth checking your local fire department for availability on these too. They hand them out for free if they carry them - and you can also make your own and tape it inside an easily visible window. Make sure to indicate what part of the house any pet is in if you have them in specific rooms or areas; i.e. the birds are in a cage in the den at the north side of the house; dogs are fenced off in the kitchen, etc. IF you have kennels and your dogs are responsive to strangers, it’s also a good idea to indicate where those are as well. It helps keep them safe until transport can be figured out if necessary.